We realise that our ordinary opening hours do not suit everyone, especially organisations like schools or scout groups. Please contact us and we will endeavour to arrange a mutually suitable time. Entry Fees: Adults – $5.00 per person. Please Note: Teachers visiting the museum to prepare for their schools visit will be admitted free of charge with prior notice. Prior notice also allows us to arrange a guide to be available for your visit. School Age Children's groups – $10.00 per child. Price includes a guided tour of the Gallipoli to Armistice Memorial in Queen's Park. Please Note: Condition for group concession – entry fees must be paid in a lump sum for the whole group and not individually. With prior notice guides will be available to assist for your visit. Museum volunteers also visit schools to explain the significance of events such as ANZAC Day, Remembrance Day and the battle of Long Tan. The museum possesses two Victoria Crosses, which are the highest decorations awarded for bravery in the armed services. One Victoria Cross was awarded to Keith Payne VC OAM, the last Australian to receive this medal. The Keith Payne display contains replicas of all 23 medals received by Keith, as well as photos and documents. 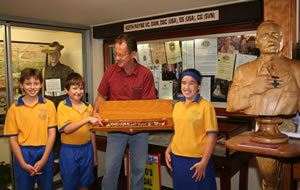 A carved wooden bust of Keith holding a Victoria Cross enables students to view this living legend in three dimensions. 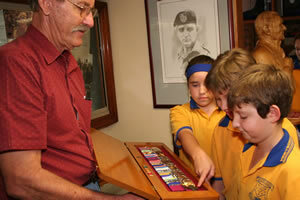 The real medals may be handled by pupils when prior arrangements have been made with museum management. 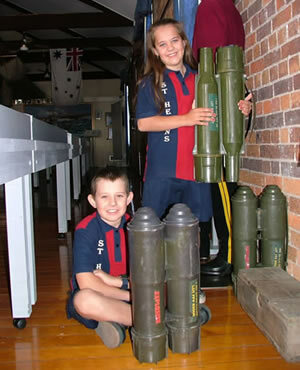 The museum contains displays on all Australian theatres of war from the Boer War to the Iraqi conflict. A Ferret Scout car and a World War Two Harley Davidson motorbike are also displayed, along with many colonial exhibits. The museum covers three levels, with only the ground floor being wheelchair accessible. With prior notice we will endeavour to provide an experience for disabled students who cannot access the higher levels. Education kits are being prepared for most age groups. We can also programme a tour with emphasis on a war, or a time.